On May 4th Hive13 together with 2600 will take part in International Day Against DRM. On May 4th you are encouraged to spread word about the harms of DRM. 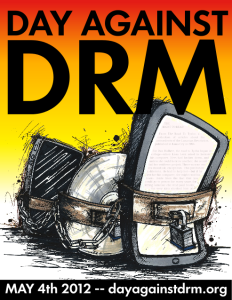 On Friday we will discuss how harmful DRM is as well as give demonstrations on how to liberate some of your digital goods from the DRM shackles. We plan to focus primarily on ebooks just to keep the demos reasonably small. If you have any experience with removing certain types of ebook protections please bring any tools or techniques with you for open discussion. At this time we already have some volunteers that will demonstrate the remove of DRM for Adobe’s DRM plus I personally have a collection of scripts for: Mobipocket (.prc/.mobi), Kindle Mobipocket (.azw), Kindle Topaz (.tpz/.azw1), Kindle Print Replica (.azw4), Adobe ePub (.epub), Adobe PDF (.pdf), B&N ePub (.epub), B&N/Fictionwise eReader (.pdb). If you want to volunteer for demos you can use the mailing list or our g+ page.